I almost never do any sort of home dec sewing. Partly it’s boring, just cutting rectangles and sewing straight lines, and partly a little bit of me feels that it’s a waste of time and fabric. Who knows if the curtains will fit the windows in the next house, and couldn’t this yardage be clothes instead? 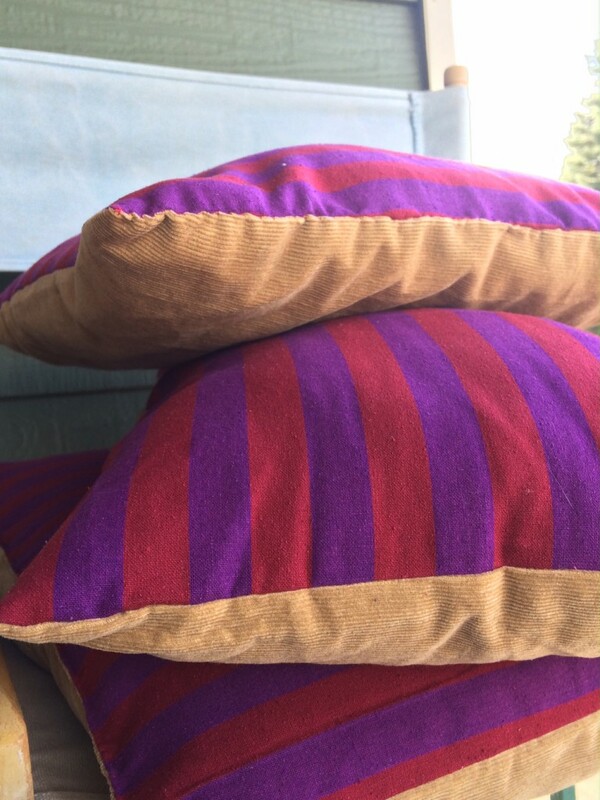 But yesterday afternoon, casting around for something creative to do in the few hours before work, I noticed the grubby, boring throw pillows in the corner of the couch and decided to do something about them at last. I had a raw silk sack dress that I had stopped wearing because I don’t particularly like sack dresses and the neckline didn’t agree with my shoulders, and had been saving especially for pillows, but there wasn’t nearly enough of it to make pillowcases for both of the old pillows, so I had to hunt through the stash for something complimentary. 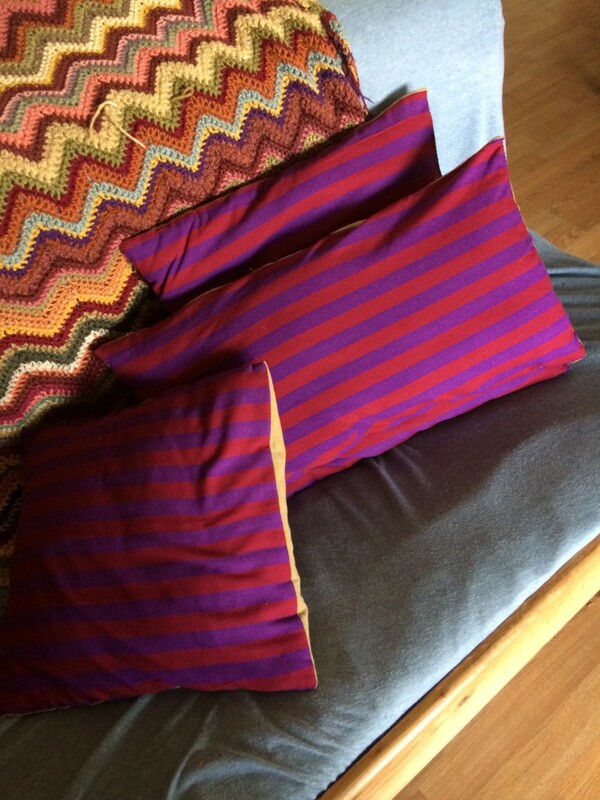 Doing only half of each pillowcase in the striped silk meant I had enough to make a third pillowcase for an uncovered pillow form I had lying around. There are still some scraps of the dress which will eventually become gorgeous bias tape. I should have put zippers in, but I didn’t feel like it, so I just handstitched the fourth side of each pillow closed, which means I’ll have to unpick and sew them back on when I wash them. But I’ll cross that bridge when I come to it, I guess. This was actually a very satisfying project. Fast, easy, and I’m really pleased with the finished product. 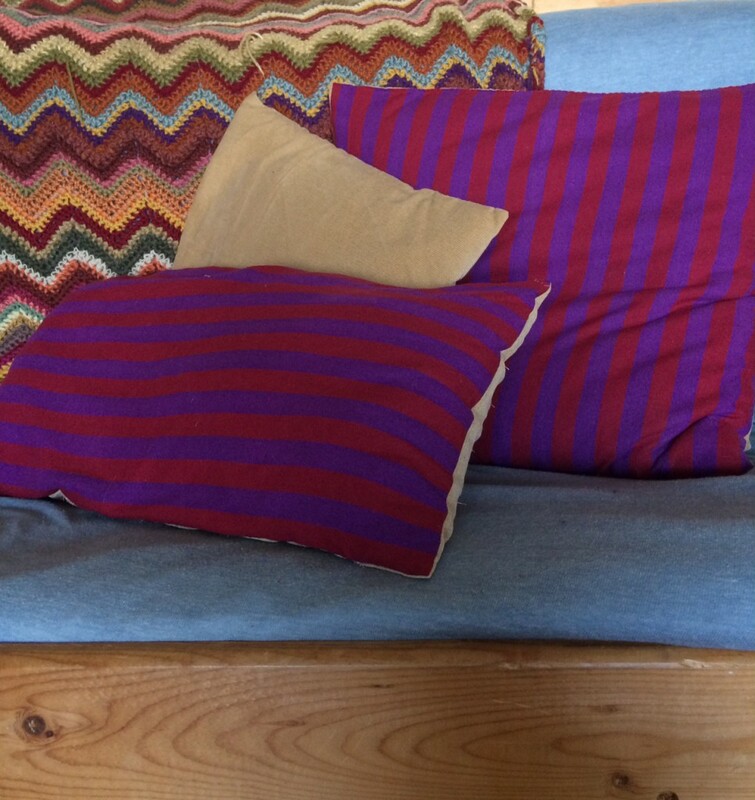 They feel much cozier than the old pillows (being half corduroy! ), and a lot more grown-up. I’m happy that the fabric previously languishing unworn in my closet finally gets to be on display! This entry was posted in sewing and tagged nesting, sewn on October 11, 2015 by Alice.